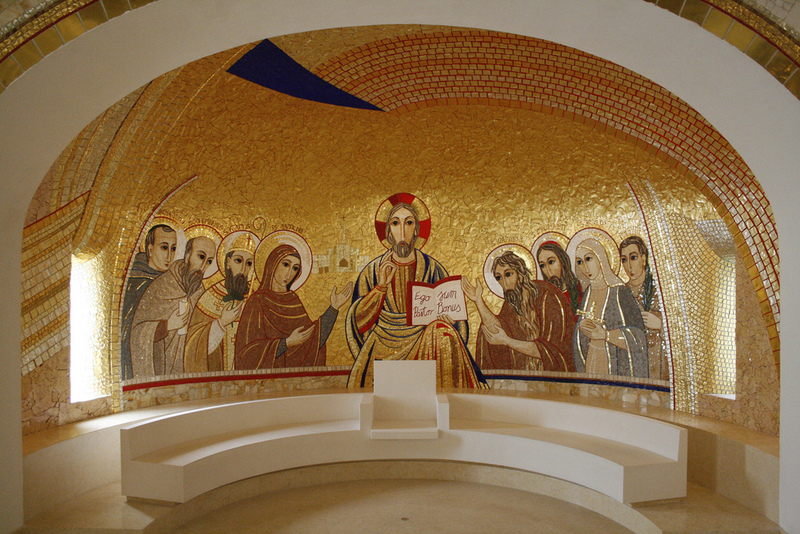 At the centre of the mosaic is Christ in glory. Gazing at this majestic figure one is immediately struck by the fact that it is really Christ who is looking at us. The open book proclaims “Ego sum pastor bonus: I am the Good Shepherd” and the expression on Christ’s face reminds us of the loving care he has for the sheep that he has come to find, gather, lead and save. The connection between the book and the figure of Christ underlines the truth of the incarnation: “the Word became flesh and dwelt among us” (Jn. 1:14). To Christ’s immediate right and left are the figures of Mary and John the Baptist, flanked by Irish saints. Both Mary and John made Christ known in unparalleled ways: Mary gave birth to Christ; John the Baptist revealed him as the Lamb of God. All are depicted in a time-honoured pose from the orthodox iconographic tradition known as deisis, a Greek word meaning ‘prayer’ or ‘intercession.’ With heads bowed and hands outstretched, the saints renounce themselves and give space to God and to others. Mary takes the place of honour beside her Son. Her “yes’ to the angel at the Annunciation allowed her to become the one who bore God to the world. John the Baptist, “the greatest of all the children born of women” (Mt. 11:11), said “he must increase and I must decrease” (Jn. 3:30). As we look at these saints we pray that our lives be marked by a similar attitude of deisis. May all that we do and say point to and serve the presence of Christ among us. Mary looks at Christ: at the face of Christ her Son to her left, and at the Body of Christ directly in front of her, the congregation present in the Church. She is the only one of the saints who looks at us. She is the one who invites us to come to her Son and to “do whatever he tells you” (Jn. 2:5). Mary, Mother of God, is also Mother of the Church and so the façade of the basilica at Knock is inserted between her own image and that of her Son. The last figure on the left-hand side of the mosaic is Blessed Columba Marmion (1858 – 1923). Beatified in September 2000, Marmion was a student at the Irish College and ordained for the Archdiocese of Dublin in 1881. He subsequently entered the Belgian Benedictine monastery at Maredsous and was noted for his preaching and spiritual writing. On the right-hand side, behind Saint John the Baptist, Saint Oliver Plunkett (1625 – 1681) is represented holding the green palm of martyrdom in his hand. Oliver Plunkett was a student at the Irish College from 1647 – 1654. The College archive has a letter written by Plunkett in which he asks to be dispensed from the vow taken at the time of his ordination to return to Ireland so that he could take up the offer of a position as professor of theology in the Propaganda Fide College in Rome. Ordained Archbishop of Armagh in 1669, Plunkett was found guilty of high treason “for promoting the Roman faith,” and was hanged, drawn and quartered at Tyburn on 1 July 1681 in the wake of the commotion stirred by Titus Oates and the alleged “Popish Plot”. He was the last Catholic martyr to die in England. Oliver Plunkett was beatified in 1920 and declared a saint in 1975, the first canonised Irish saint for almost seven hundred years. Next to Saint Oliver is Saint Brigid, the Patroness of Ireland, who holds her distinctive cross in her hands. The last figure on the right, depicted without a halo but with the palm of martyrdom, is Father Ragheed Ganni (1972 – 2007). Ragheed, an engineering graduate from the University of Mosul, Iraq, was a student at the Irish College from 1996 – 2003. Ordained in 2001, he celebrated his first Mass here in this College Chapel. Following the completion of postgraduate studies, he returned to his native Mosul. Despite many death threats, and attacks on his family, his house and on his church, Ragheed insisted that he stay in Mosul to minister to his fellow Chaldean Catholics. He was murdered together with three sub-deacons as he emerged from celebrating Mass on 3 June 2007. Placed at the end of the row of saints, Ragheed is a visible link between the community that prays in the Chapel and the blessed in heaven. His presence reminds us of the future glory that awaits all who strive to be faithful to the Gospel.